We've had a blast this month! Daphne plays concerts for me everyday. I sit quietly while she plays, then she looks at me for an applause. So cute. We went to East Canyon for the Wilcock Sisters' Retreat- so much fun! Daph turned 13 months old on the 21st, and we did our first piggy tails to celebrate. We also started coloring practice. This mostly consists of Mama coloring and Daphne taking all the crayons out of the box. Our favorite thing lately has been swimming lessons!! We have loved our mom and tot class, and are so sad that it is ending next week. Daphne LOVES the pool, and gets upset every time we have to get out of the water. She loves to splash and swim on her tummy, kick, blow bubbles, and the other day she kept putting her whole face in the water and would come up laughing. She's a swimming champ. We were also able to go to Discovery Gateway Children's Museum for the first time, and loved it. Daphne was so excited on the day that Jared and his parents came to watch her swim. She kept looking over and waving. ~She has the cutest "cheese" squinty face! ~Started crawling February 7th! My baby can move! She is also getting more stable on her feet and is getting closer to walking everyday. ~She said her first word, "car," February 17th! She loves looking out the window and telling me about the cars driving by or the ones she can see parked outside. ~Started saying "go" February 28th. She says "go" when she drops a toy or when we ask her "where'd it go?" ~Puts herself to sleep without a peep at night, but still wakes up 2-3 times each night. Crappy sleep has been my biggest challenge of Motherhood. ~Loves animals! We went to PetsMart on adoption day a couple of weeks ago, and she LOVED it! She starting crying when we had to leave. 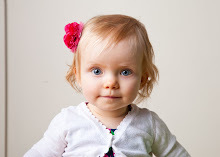 ~Is close to saying "ball"
~She is SO friendly, and loves waving and saying "hi" to everyone we see! ~Daph is a hilarious little angel, and we are SO glad she is ours!! She also got a marriage proposal last Sunday... the most adorable little boy was sitting next to me in our Primary class and he looked right at me and told me, "I'm going to marry Daphne."